Solute carrier family 41 member A1 (SLC41A1) has been suggested to mediate magnesium (Mg2+) transport by several in vitro studies. However, the physiological function of SLC41A1 remains to be elucidated. In this study, cellular Mg2+ transport assays combined with zebrafish slc41a1 knockdown experiments were performed to disclose SLC41A1 function and its physiological relevance. The gene slc41a1 is ubiquitously expressed in zebrafish tissues and is regulated by water and dietary Mg2+ availability. Knockdown of slc41a1 in zebrafish larvae grown in a Mg2+-free medium resulted in a unique phenotype characterized by a decrease in zebrafish Mg content. This decrease shows that SLC41A1 is required to maintain Mg2+ balance and its dysfunction results in renal Mg2+ wasting in zebrafish larvae. Importantly, the Mg content of the larvae is rescued when mouse SLC41A1 is expressed in slc41a1-knockdown zebrafish. 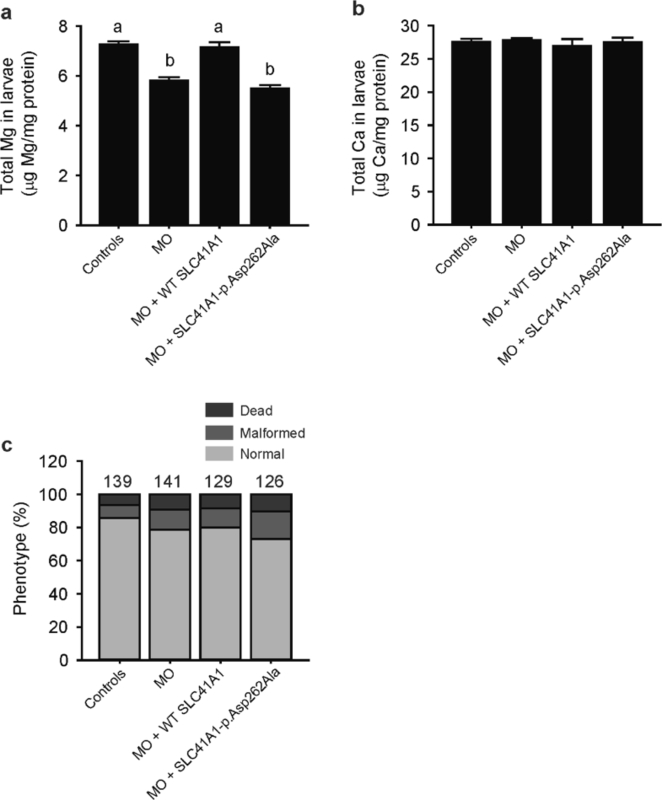 Conversely, expression of mammalian SLC41A1-p.Asp262Ala, harboring a mutation in the ion-conducting SLC41A1 pore, did not reverse the renal Mg2+ wasting. 25Mg2+ transport assays in human embryonic kidney 293 (HEK293) cells overexpressing SLC41A1 demonstrated that SLC41A1 mediates cellular Mg2+ extrusion independently of sodium (Na+). In contrast, SLC41A1-p.Asp262Ala expressing HEK293 cells displayed similar Mg2+ extrusion activities than control (mock) cells. In polarized Madin-Darby canine kidney cells, SLC41A1 localized to the basolateral cell membrane. Our results demonstrate that SLC41A1 facilitates renal Mg2+ reabsorption in the zebrafish model. Furthermore, our data suggest that SLC41A1 mediates both Mg2+ uptake and extrusion. Joost G. J. Hoenderop and Jeroen H. F. de Baaij contributed equally to this work. The online version of this article ( https://doi.org/10.1007/s00424-018-2234-9) contains supplementary material, which is available to authorized users. Magnesium (Mg2+) reabsorption in the kidney is key for Mg2+ homeostasis. Of the 2400 mg of Mg2+ filtered in the kidney on a daily basis in humans, 95–99% is recovered through tubular Mg2+ reabsorption . Indeed, impaired renal Mg2+ handling results in a heterogeneous group of disorders that are characterized by hypomagnesemia (serum Mg2+ < 0.7 mmol/L) . Patients suffer from fatigue, seizures, and muscle cramps. Over the last decade, studying hereditary forms of hypomagnesemia and urinary Mg2+ wasting has resulted in the elucidation of the molecular mechanisms that regulate renal Mg2+ reabsorption . Mg2+ is filtered in the glomerulus and subsequently passively reabsorbed in the proximal tubule (PT, 25%) and thick ascending limb of Henle’s loop (TAL, 70%). The remainder is reabsorbed in the distal convoluted tubule (DCT), where Mg2+ reabsorption takes place in a transcellular manner via transient receptor potential melastatin type 6 (TRPM6) Mg2+ channels . Mutations in TRPM6 cause hypomagnesemia and secondary hypocalcemia (HSH) [25, 29]. Its membrane expression and channel activity are dependent on the epidermal growth factor (EGF), insulin, estrogen, flavaglines, and ATP [3, 5, 8, 23, 26]. TRPM6 is the apical gatekeeper for the regulation of renal Mg2+ reabsorption. However, the basolateral Mg2+ extrusion mechanism remains subject of debate, and no proteins have been characterized facilitating this process . Recently, the solute carrier family 41 member A1 (SLC41A1) was suggested to facilitate cellular Mg2+ extrusion by operating as a Na+-Mg2+ exchanger [17, 20]. SLC41A1 is a distant homolog of the bacterial MgtE Mg2+ transporter and is widely expressed in the human body [24, 28]. In the kidney, SLC41A1 proteins are localized in the macula densa, TAL, and DCT , and target the basolateral membrane when expressed in a polarized renal epithelial cell line . In addition, dietary Mg2+ was shown to regulate renal Slc41a1 gene expression in mice . Despite these evidences linking SLC41A1 with cellular Mg2+ transport, SLC41A1 has not been linked with the regulation of the Mg2+ balance in vivo, remaining unclear whether SLC41A1 is relevant for renal Mg2+ reabsorption. In this study, we aimed to elucidate the physiological role of SLC41A1 by knockdown experiments in the zebrafish model. Moreover, the molecular function of SLC41A1 was studied by cellular Mg2+ transport experiments. The full-length mouse Slc41a1 transcript was amplified from a cDNA clone with GenBank accession number NM_173865 (Source BioScience, Nottingham, UK) using Phusion polymerase. The primer sequences contained AscI and XbaI and are provided in Table 1. The amplicons were ligated into the pCINeo-IRES-GFP expression vectors containing an in-frame N-terminal HA-tag using the AscI and XbaI restriction sites. The p.Asp262Ala mutation in mouse SLC41A1 (equivalent to the p.Asp263Ala mutation in the human SLC41A1 sequence) was introduced using the QuikChange site-directed mutagenesis kit (Agilent, Amstelveen, The Netherlands). For experiments in the zebrafish model, the SLC41A1 constructs were subcloned into pT7Ts vectors using the AscI and XhoI restriction enzymes. All constructs were verified by sequence analysis. Throughout the manuscript, we followed the guidelines from HUGO, MGI, and ZFIN on gene nomenclature for human, mouse, and zebrafish genes, respectively. Zebrafish from the Tupfel long-fin (TLF) strain were used for experimentation. For the study of the tissue distribution of slc41a1 in adult zebrafish tissues, three females and three males were dissected following anesthesia (0.1% (v/v) 2-phenoxyethanol (Sigma Chemical Co., St. Louis, USA)). Brain, ovary, gills, testis, heart, spleen, kidney, gut, operculum, scales, and liver tissues were collected and stored at − 80 °C until analysis. 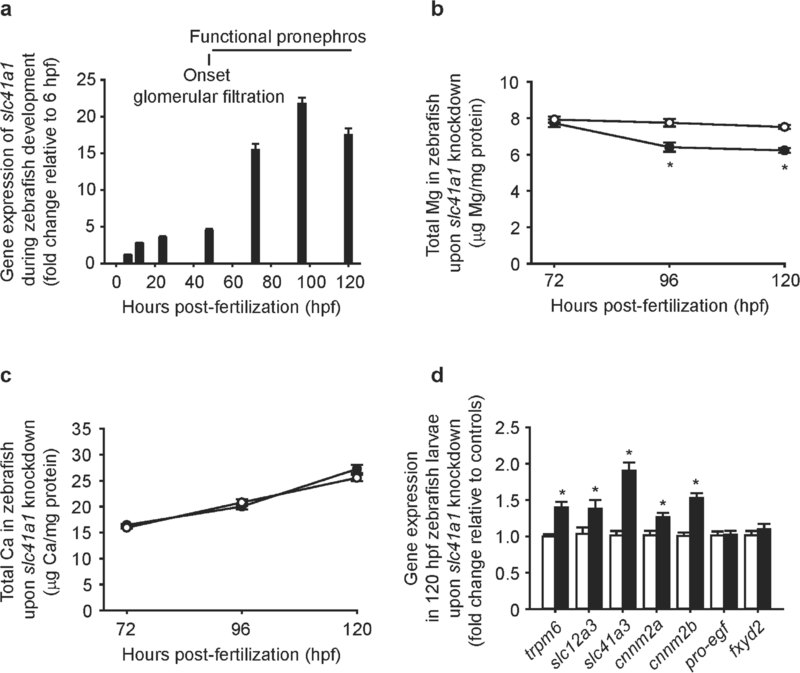 The expression of slc41a1 in the pronephric tissue was determined in 120 hours post-fertilization (hpf) zebrafish which were grown in E3 medium (0.33 mmol/L MgSO4 5 mmol/L NaCl, 0.17 mmol/L KCl, 0.33 mmol/L CaCl2). After anesthesia with tricaine/Tris pH 7.0 solution, the pronephros was isolated from zebrafish larvae as previously reported . Samples were constituted by 10 pronephros each, which were stored at − 80 °C until further analysis. For the study of the expression of slc41a1 during zebrafish development, zebrafish were grown in E3 medium and sampled at 6, 12, 24, 48, 72, 96, and 120 hpf. For sampling, animals were anesthetized with tricaine/Tris pH 7.0 solution. Each sample was constituted of 10 embryos/larvae and was stored at − 80 °C until further analysis. To study the regulation of slc41a1 gene expression by dietary and water Mg2+ in zebrafish gills and kidney, fish Mg2+ balance was challenged by feeding different Mg2+ diets (0, 0.07, or 0.7% (w/w) Mg) or by exposure to different water Mg2+ concentrations (0, 0.2, 2 mmol/L) as previously reported . Sampling took place 24 h after the last feeding. Fish were anesthetized in 0.1% (v/v) 2-phenoxyethanol (Sigma Chemical Co., St. Louis, USA). After anesthesia, death of animals was induced by spinal transaction and organs were collected, immediately frozen in liquid nitrogen, and stored at − 80 °C until analysis. To study the regulation of slc41a1 gene expression and of the zebrafish orthologs of human magnesiotropic genes expressed in the DCT (trpm6, slc12a3, slc41a3, cnnm2a, cnnm2b, pro-egf, and fxyd2) in 120 hpf zebrafish, zebrafish embryos were grown in different Mg2+-containing E3 mediums from fertilization until 120 hpf, time at which sampling took place. The different Mg2+-containing E3 mediums had the following electrolyte concentrations (in mmol/L): low Mg2+ water, 5 NaCl, 0.17 KCl, 0.33 CaCl2; control Mg2+ water, 0.33 MgSO4, 5 NaCl, 0.17 KCl, 0.33 CaCl2; high Mg2+ water, 25 MgSO4, 5 NaCl, 0.17 KCl, 0.33 CaCl2. At 120 hpf, zebrafish were anesthetized with tricaine/Tris pH 7.0 solution and samples (10 larvae/sample) were collected and stored at − 80 °C until further analyses. Zebrafish eggs were obtained from natural spawning of wild-type (WT) TLF zebrafish which were bred and raised under standard conditions (28.5 °C and 14 h of light:10 h of dark cycle) in accordance with international and institutional guidelines. Two non-overlapping morpholinos (MOs) targeting slc41a1 transcripts were used: a translation blocking MO 5′-TGATCTTTCAACCAGAGTACCATGC-3′ and a splice-site blocking MO 5′-GAAGGACTCAATGGTCTCACCTAAA-3′ (Gene Tools, Philomath, OR, USA). In parallel with these slc41a1-MOs, a standard mismatch MO directed (control-MO) against a human β-globin intron mutation, 5′-CCTCTTACCTCAGTTACAATTTATA (Gene Tools, Philomath, OR, USA), was used in control zebrafish. MOs were diluted in deionized, sterile water supplemented with 0.5% (w/v) phenol red and injected in a volume of 1 nL into the yolk of one- to two-cell stage embryos using a pneumatic PicoPump pv280 (World Precision Instruments, Sarasota, FL, USA). WT embryos (uninjected) were also included in the experiments to control for the effects of the injection procedure per se. After injection, embryos from the same experimental condition were placed in three Petri dishes and cultured at 28.5 °C in Mg2+-free E3 medium (in mmol/L: 5 NaCl, 0.17 KCl, 0.33 CaCl2) or normal E3 medium containing 0.33 mmol/L MgSO4, which was refreshed daily. Three different types of experiments were carried out: a dose-response experiment (doses of 4, 8, and 16 ng/embryo of translation or splice-site blocking slc41a1-MO and 16 ng/embryo control-MO, sampling at 120 hpf), a time-course experiment (doses of 16 ng/embryo of splice-site blocking MO and 16 ng/embryo control-MO, sampling at 72, 96, and 120 hpf), and an experiment to study the gene expression of slc41a1, trpm6, slc12a3, slc41a3, cnnm2a, cnnm2b, pro-egf, and fxyd2 (doses of 16 ng/embryo of splice-site blocking MO and 16 ng/embryo control-MO, sampling at 120 hpf). During samplings, animals were anesthetized with tricaine/Tris pH 7.0 solution, and morphologic phenotypes were analyzed under the microscope (Leica Microsystems Ltd., Heerburgg, Germany). Two morphologic phenotypes were distinguished: normal and malformed (kidney failure features such as enlarged pericardial cavities indicating defects in glomerular filtration and/or pronephric cysts indicating defects in renal fluid flow). After phenotyping, only morphologically normal fish were sampled, each sample constituted of 10 larvae, which were stored at − 80 °C until further analyses. In vivo cRNA rescue experiments were performed with mouse WT SLC41A1 and mutant SLC41A1-p.Asp262Ala cRNAs. Constructs were subcloned into the pT7Ts expression vector, suitable for rescue experiments in zebrafish [6, 18], and cRNAs were prepared using the mMESSAGE mMACHINE Kit (Ambion, Austin, TX, USA) according to the manufacturer’s instructions. The cRNAs, in an amount of 100 pg, were co-injected with the splice-site blocking slc41a1-MO as described above. At 120 hpf, zebrafish were anesthetized with tricaine/Tris pH 7.0 solution, and morphologically normal zebrafish were sampled. Samples, constituted by 10 larvae/sample, were stored at − 80 °C until further analyses. Sample processing started by quickly washing the samples with nanopure water in order to avoid contamination of remaining water Mg2+ and Ca2+. The washing procedure was repeated twice. Fish were then dried and digested as described previously . The total Mg and Ca content in each sample were determined with colorimetric assays [2, 16]. Within-run precision and accuracy were controlled by means of an internal control Precinorm (Roche Diagnostics, Mannheim, Germany). Furthermore, samples were normalized by protein content, which was determined with the Pierce BCA protein assay kit (Pierce Biotechnology, Rockford, IL, USA). RNA was isolated from zebrafish adult tissues, the pronephros, and total embryos/larvae using TRIzol reagent (Invitrogen, Carlsbad, CA, USA) according to the manufacturer’s instructions, in which glycogen (Fermentas GmbH, St. Leon-Rot, Germany) was used in order to maximize the RNA recovery. One microgram of RNA (200 ng in the case of the pronephric samples) was subjected to DNase treatment to prevent genomic DNA contamination and subsequently used to perform the reverse transcriptase reaction. Changes in target genes mRNA levels were determined by relative real-time quantitative polymerase chain reaction (RT-qPCR) as previously described  and in accordance with the MIQUE guidelines  with a CFX96™ Real-Time PCR Detection System (Bio-Rad Laboratories, Hercules, CA) using iQ™ SYBR Green Supermix (Bio Rad) detection of single PCR product accumulation. Gene expression levels were normalized to the expression levels of the standard zebrafish-specific reference elongation factor-1α (elf1α) [1, 22]. Relative mRNA expression was analyzed using the Livak method (2−ΔΔCt). Primer sequences are shown in Table 2. To determine the knockdown mechanism induced by the splice-site blocking slc41a1-MO, cDNA from 120 hpf control (injected with 16 ng control-MO) and morphant (injected with 16 ng splice-site blocking slc41a1-MO) larvae was used for PCR analysis. Three different primer pairs flanking exon 5 were used (Table 2). Amplicons thus obtained were subjected to electrophoresis in 1.5% (w/v) agarose gel. The efficacy of the splice-site blocking MO targeting exon 5 (145 bp) in the slc41a1 gene was measured by RT-qPCR following the methods described above. The specific primers used are shown in Table 2. The forward primer was designed to hybridize exon 5, the exon targeted by the splice-site blocking slc41a1-MO. Thus, the resulting amplicon quantification reflects the expression levels of the functional, non-spliced slc41a1. In addition, slc41a1 expression of the total slc41a1 transcript, which entails non-spliced and aberrantly spliced variants, was measured by RT-qPCR (primers used are shown in Table 2). HEK293 cells were grown in Dulbecco’s modified Eagle’s medium (DMEM, Bio Whittaker-Europe, Verviers, Belgium) containing 10% (v/v) fetal calf serum (PAA, Liz, Austria), 2 mmol/L L-glutamine, and 10 μg/mL non-essential amino acids, at 37 °C in a humidity-controlled incubator with 5% (v/v) CO2. The cells were transiently transfected with the respective DNA constructs using Lipofectamine 2000 (Invitrogen, Breda, The Netherlands) at 1:2 DNA:Lipofectamine ratio for 48 h unless otherwise stated. Madin-Darby kidney (MDCKI) cells were cultured in DMEM with 5% (v/v) fetal calf serum (PAA, Liz, Austria), 2 mmol/L L-glutamine, ciproxin, and 10 μg/mL non-essential amino acids, at 37 °C in a humidity-controlled incubator with 5% (v/v) CO2. The cells were stably transfected with SLC41A1 using Metafectene pro (Biontex) in 1:3 DNA:Metafectene ratio. After 48 h, transfected cells were placed on selection medium containing 0.8 mg/mL G418 and 0.15 mg/mL hygromycin for 14 days. HEK293 cells were seeded in 12-well plates (0.5 × 106 cells/12 wells) and transfected with empty (mock), WT, and mutant SLC41A1 constructs for 48 h and seeded on poly-L-lysine (Sigma)-coated 12-well plates. For extrusion experiments, the cells were transferred to Mg2+-free medium supplemented with 1 mmol/L 25Mg2+ during the last 24 h (purity ± 98%, Cortecnet, Voisins le Bretonneux, France). Before the start of the experiment, cells were washed three times in basic uptake buffer (in mmol/L: 125 NaCl, 5 KCl, 0.5 CaCl2, 0.5 Na2HPO4, 0.5 Na2SO4, 15 HEPES/NaOH pH 7.5) and subsequently placed in basic uptake buffer with 0.5 mmol/L Mg2+ (Sigma, containing ± 10% 25Mg2+) for 5, 10, or 15 min. For experiments using NMDG, NaCl was replaced in the buffer by NMDG (pH 7.4 with HCl), and in the Cl-free experiments, NaCl, KCl, and CaCl2 were replaced by Na-gluconate, K-gluconate, and Ca-gluconate (pH 7.4 with NaOH). The buffer was removed and subjected to inductively coupled plasma mass spectrometry (ICP-MS) analysis. Uptake experiments were performed as described previously . Naturally occurring 25Mg content of the cells was determined at time point 0 and was subtracted from the other time points when calculating net fluxes. In the experiments using pharmacological inhibition, 100 μM quinidine, 100 μM ouabain, and 100 μM 2-APB were added 30 min before the start of the uptake. The coefficient of variation (CV) for intra-assay and inter-assay variability has been calculated to determine the variability of our assay. The intra-assay CV is 4% and the inter-assay CV is 12%. HEK293 cells were transfected with WT and mutant SLC41A1 constructs for 48 h. Cell surface proteins were biotinylated as described previously . Protein lysates were subjected to SDS-PAGE and immunoblots were incubated using mouse anti-HA (1:5000; Cell Signaling, Danvers, MA, USA). HEK293 cells were transfected for 48 h with WT and mutant SLC41A1 constructs. Protein lysates were denatured in Laemmli containing 100 mmol/L DTT for 30 min at 37 °C and subsequently subjected to SDS-PAGE. Then, immunoblots were incubated with a mouse anti-HA (Roche, high affinity 3F10, 1:5000) primary antibody and peroxidase-conjugated sheep anti-mouse secondary antibodies (Jackson Immunoresearch, 1:10,000). SLC41A1-expressing MDCKI cells were seeded on 0.4 μm transwell filters (Corning Costar) and cultured for 7 days. Subsequently, the cells were rinsed with PBS and fixed for 30 min with 4% (w/v) paraformaldehyde solution in PBS, permeabilized in 0.3% (v/v) Triton in PBS for 15 min, and quenched for 15 min in 50 mM NH4Cl. After blocking with goat serum (16% (v/v) for 30 min), cells were incubated with primary antibody rat anti-HA (Roche Applied Science, 1:250) or anti-E-Cadherin (Sigma, 1:250) for 60 min. After rinses in PBS, cells were incubated with Alexa Fluor 488-conjugated donkey anti-rat IgG or Alexa Fluor 594-conjugated donkey anti-rabbit IgG secondary antibodies (Jackson, 1:300) and DAPI for 45 min. After PBS and ethanol rinses, the cells were mounted on slides using Mowiol. Fluorescence microscopy was performed with a Zeiss inverted microscope, and images were taken with ImageJ software. All results are depicted as mean ± standard error of the mean (S.E.M.). Statistical analyses were conducted by one-way ANOVA. Tukey’s post-test was used to identify significantly different groups. When only two experimental groups were present (e.g., analysis of slc41a1 expression in the pronephros), an unpaired Student’s t test was used. Statistical significance was accepted at P ˂ 0.05. To examine the involvement of SLC41A1 in Mg2+ homeostasis, the zebrafish model was used. The zebrafish is a versatile model to study electrolyte handling in mammals, as its nephron segmentation patterns and ion transport functions are similar to those present in the mammalian nephron [2, 6, 12, 19, 30]. The zebrafish ortholog of mammalian SLC41A1 is highly conserved: 77% of amino acid (AA) identity compared to its human counterpart (Online Resource 1). In general, the 10 hydrophobic transmembrane domains (TMD) are well conserved between zebrafish Slc41a1 and human, mouse, or rat SLC41A1 (Online Resource 1). The two motifs PX6GN and P(D/A)X4PX6D, which form the Mg2+ selective pore , are present in the zebrafish Slc41a1 protein and display an identity of 100% with respect to the human, mouse, and rat SLC41A1 (Online Resource 1). Similar to mammals , the zebrafish slc41a1 gene is ubiquitously expressed in adult tissues (Fig. 1a). The gene expression of slc41a1 in the kidney and gills of adult zebrafish is regulated by dietary and water Mg2+, respectively (Fig. 1b, c). In zebrafish larvae (120 hpf), slc41a1 is expressed in the pronephros (Fig. 1d). Growth of zebrafish in different Mg2+-containing E3 mediums evoke distinct total Mg and Ca content patterns in 120 hpf zebrafish larvae (Fig. 1e, f). Importantly, gene expression of slc41a1 is regulated by Mg2+ in these larvae (120 hpf), similarly to the orthologs of mammalian DCT-specific genes such as trpm6, slc41a3, and cnnm2a (Fig. 1g). Knockdown of slc41a1 by a splice-site blocking MO in zebrafish grown in a Mg2+-free E3 medium resulted in a downregulation of functional (non-spliced) slc41a1 transcripts (Fig. 2b). In addition, the morphology between slc41a1 morphants and controls was identical (Fig. 3a–f). However, the total Mg content was significantly decreased in slc41a1 morphants compared to controls while the total Ca content remained unchanged (Fig. 3g, h). This result is not secondary to any morphologic/developmental phenotype since total Mg and Ca levels were determined in morphologically normal slc41a1 morphants and controls. When slc41a1 morphant larvae were grown in Mg2+-containing E3 medium (0.33 mM Mg2+), the morphology of slc41a1 morphants was also comparable to controls (Fig. 3i), and the total Mg content was not restored in morphologically normal zebrafish slc41a1 morphants to the levels observed in morphologically normal control larvae (Fig. 3j, k). 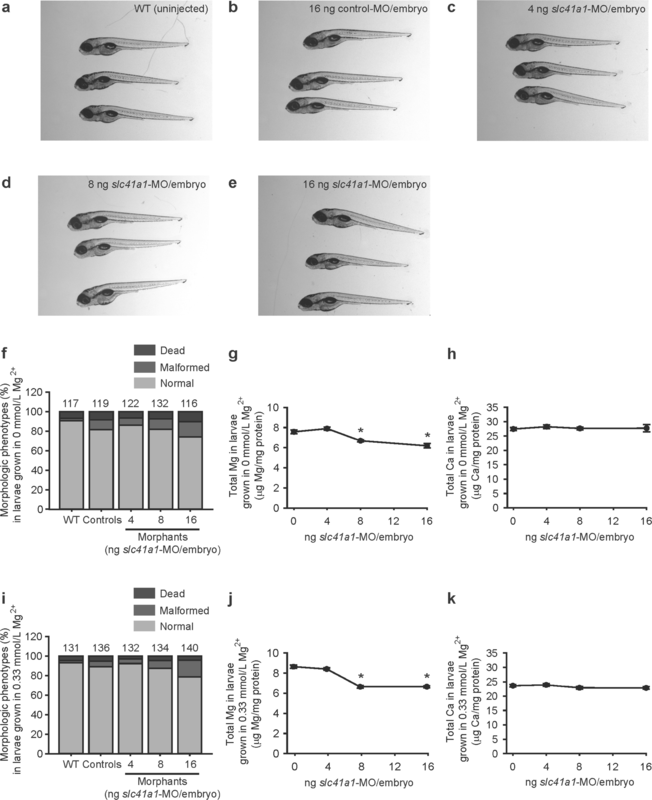 The specificity of the decreased Mg content observed when knocking down slc41a1 in zebrafish with the splice-site blocking MO was confirmed by repeating the experiments with a second non-overlapping oligo, a translation blocking MO: similar results were obtained (Fig. 4). 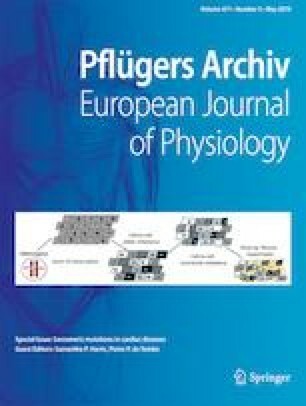 Importantly, the disturbances in the total Mg content in morphologically normal zebrafish slc41a1 morphants grown in Mg2+-free E3 medium were detectable only from 96 hpf, a time point in which the pronephros is fully functional  and at which slc41a1 shows its highest gene expression levels in zebrafish (Fig. 5a, b). Conversely, total Ca levels were comparable between slc41a1 morphants and controls during development (Fig. 5c). Moreover, potential DCT compensatory mechanisms to the decreased total Mg levels were observed in slc41a1 morphants and were illustrated by an upregulation of trpm6, slc12a3, slc41a3, cnnm2a, and cnnm2b gene expression (Fig. 5d). Importantly, the expression of total slc41a1 transcripts was also upregulated in slc41a1 morphants (Fig. 2c), further corroborating the regulation of slc41a1 expression by Mg2+. 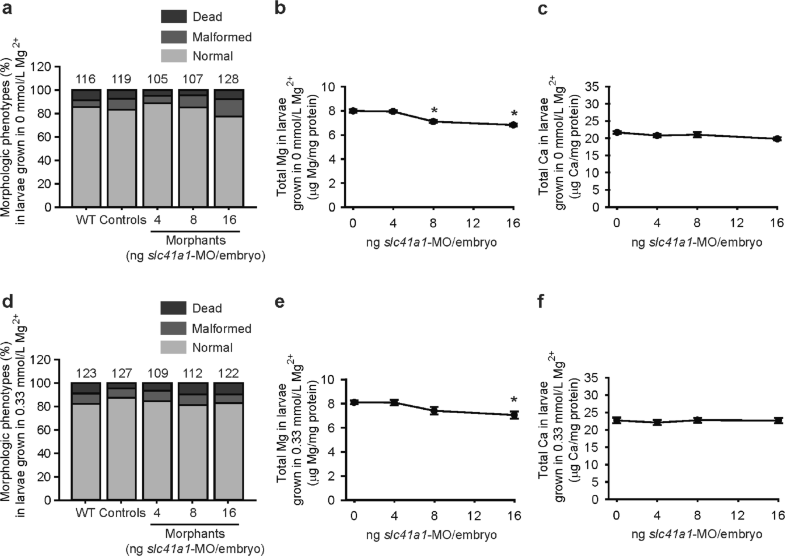 The functional equivalency between zebrafish Slc41a1 and mammalian SLC41A1 was demonstrated by the fact that co-injection of the splice-site blocking MO against zebrafish slc41a1 with mouse WT Slc41a1 cRNA resulted in total Mg levels in 120 hpf zebrafish comparable to controls (Fig. 6a). In addition, these results further proved the specificity of the knockdown approach used in the zebrafish. Importantly, expression in slc41a1 morphants of the mouse mutant SLC41A1-p.Asp262Ala, homologous with the pore MgtE-p.Asp432Ala mutant that abolishes MgtE Mg2+ transport in Thermus thermophilus , did not result in similar total Mg levels between slc41a1 morphants and controls (Fig. 6a). No changes in total Ca levels were observed (Fig. 6b). As in previous experiments, total Mg and Ca levels were measured only in morphologically normal slc41a1 morphants and controls. Similar proportions of morphologic phenotypes were observed in all experimental conditions tested (Fig. 6c). SLC41A1 has been proposed to function as basolateral Na+-Mg2+ exchanger . To examine the Mg2+ transport capacities of SLC41A1, HEK293 cells were loaded for 24 h with 25Mg2+; subsequently, extrusion was monitored for 15 min. 25Mg2+ extrusion was increased in SLC41A1-expressing cells compared to mock-transfected cells (Fig. 7a). To show that the Mg2+ extrusion is facilitated by SLC41A1, the Mg2+-selective residue of the putative pore forming domain of SLC41A1 was mutated (p.Asp262Ala) . Indeed, Mg2+ extrusion in cells expressing SLC41A1-p.Asp262Ala was comparable to mock (Fig. 7b). Cells expressing SLC41A1 had marginally, but significantly, higher intracellular 25Mg levels after 24 h loading (Fig. 7c). Plasma membrane expression of WT and mutant SLC41A1 proteins was comparable, as shown by cell surface biotinylation (Fig. 7d). To examine whether the 25Mg2+ extrusion depends on Na+ or Cl−, the NaCl in the basic buffer was replaced for NMDG-Cl or Na-gluconate, respectively. Interestingly, SLC41A1-dependent 25Mg2+ extrusion was present in all conditions (Fig. 7e). To exclude a potential role of the membrane potential on SLC41A1-mediated 25Mg2+ extrusion, cells were incubated with ouabain, an inhibitor of the Na+-K+-ATPase. Although ouabain reduced 25Mg2+ extrusion in both mock and SLC41A1 expressing cells, it did not change the SLC41A1-mediated extrusion. Given that SLC41A1-mediated Mg2+ extrusion was not Na+-dependent in our setup, we examined whether SLC41A1 can facilitate Mg2+ uptake despite high extracellular Na+ concentrations using physiological conditions of 1 mM Mg2+ and 140 mM Na+ in the extracellular buffer. Indeed, SLC41A1 increases 25Mg2+ uptake fivefold compared to mock-transfected cells (Fig. 8a, b). Given that SLC41A1-mediated transport has been shown to be electroneutral and Na+ was excluded as a counter-ion, Cl− was considered to be co-transported with Mg2+. However, SLC41A1-mediated 25Mg2+ uptake was unaffected by using a Na-gluconate buffer instead of NaCl (Fig. 8c). Moreover, SLC41A1 function could not be inhibited using 2-APB, an inhibitor of TRPM7 Mg2+ channels, ouabain, and quinidine, a non-selective Na+-channel blocker (Fig. 8d). SLC41A1 was previously shown to be expressed in TAL and DCT cells . To examine its subcellular localization, MDCKI cells were stably transfected with HA-tagged SLC41A1. Immunocytochemical analysis demonstrated that HA-tagged SLC41A1 was expressed at the basolateral membrane, co-expressing with plasma membrane marker E-cadherin (Fig. 9). Additionally, HA-tagged SLC41A1 expression was detected in intracellular structures, possibly vesicles or the Golgi apparatus. In the present study, we show that SLC41A1 is essential for Mg2+ homeostasis. Our main finding is that slc41a1 knockdown causes a reduced Mg content in zebrafish larvae. Importantly, this Mg2+ deficiency can be rescued by expression of mammalian SLC41A1. Our results demonstrate that SLC41A1 is integral to the basolateral membrane and is involved in cellular Mg2+ uptake as well as extrusion in cultured renal epithelial cells. Based on our findings, we propose that SLC41A1 contributes to basolateral Mg2+ transport in the kidney. The low Mg content in zebrafish slc41a1 morphants points to a specific renal Mg2+ leak. The decrease in total Mg content can only be explained by renal (pronephric) Mg2+ wasting since the pronephros is the only exiting route for Mg2+ in developing zebrafish (0–120 hpf). In this time frame, there is no intestinal Mg2+ excretion since zebrafish do not eat and also do not drink as they are hyperosmotic with respect to the surrounding environment. 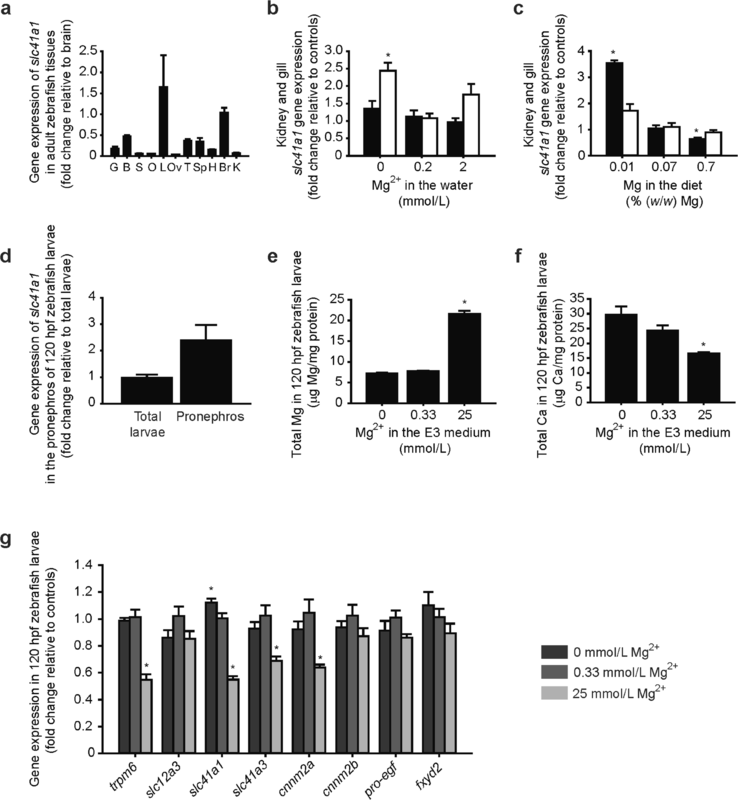 In addition, by growing the zebrafish in a Mg2+-free E3 medium, skin Mg2+ uptake is abolished, so the lower Mg content in slc41a1 morphants compared to controls can only be explained by deficient tubular Mg2+ reabsorption. In agreement with a defect in renal Mg2+ reabsorption, the total Mg content in slc41a1 morphants was decreased after full maturation of the pronephros (96 and 120 hpf) but not at earlier time points . Our cell experiments support a basolateral expression pattern of SLC41A1 that is in line with a Mg2+ extrusion function. As SLC41A1 is expressed in the DCT , where transcellular transport of Mg2+ occurs, it can be reasoned that SLC41A1 may contribute to the extrusion of Mg2+ in this segment of the nephron. In line with these findings, mRNA expression of genes involved in DCT Mg2+ reabsorption was upregulated in slc41a1 morphants (trpm6, slc12a3, cnnm2a, cnnm2b, and slc41a3 [9, 10]), further supporting a Mg2+ transport defect in the DCT. However, a function of SLC41A1 in the TAL cannot be discarded. The renal Mg2+ leak in slc41a1 morphants could not be explained by glomerular dysfunction and/or disturbances in renal fluid flow, because enlarged pericardial cavities (fluid retention) and pronephric cysts were absent in the fish where the total Mg content was measured. These kidney defects have been, however, associated with slc41a1 knockdown in a study by Hurd et al. . Differences in the doses of morpholino administered to the zebrafish embryos may explain this additional phenotype observed by Hurd et al. in slc41a1 morphants. The renal Mg2+ wasting phenotype in slc41a1-knockdown zebrafish was rescued by expression of mouse WT SLC41A1 but not by expression of SLC41A1-p.Asp262Ala, harboring a mutation in a key residue for SLC41A1 function . This important finding proved the specificity of our loss-of-function approach. But more importantly, it indicated that the Mg2+ transport function of SLC41A1 is required to rescue the phenotype and that zebrafish Slc41a1 is functional equivalent to mammalian SLC41A1. In line with SLC41A1 function in vivo, we demonstrate that SLC41A1 is a Mg2+ transporter that facilitates cellular Mg2+ uptake as well as Mg2+ extrusion dependent on the concentration gradient. In contrast to previous studies suggesting that SLC41A1 functions as a Na+-Mg2+ exchanger, our results do not support a Na+-dependent mechanism [17, 20]. Our findings show that SLC41A1 transports Mg2+ in Na+-free (NMDG-containing) buffer which cannot be blocked by Na+-channel blocker quinidine and Na+-K+-ATPase inhibitor ouabain. The molecular mechanism of SLC41A1-mediated Mg2+ transport remains elusive. SLC41A1 function is not altered by ouabain, in line with an electroneutral transport mode and a Na+-independent mechanism. Our experiments exclude Cl− as co-transported ion, but we were not able to identify the counter/co-ion. Based on the strong capacity of SLC41A1 to mediate both Mg2+ uptake and extrusion, the Mg2+ gradient seems to be the main determinant of Mg2+ transport. Previous studies have suggested the presence of a Mg2+-Mg2+ exchange mechanism in erythrocytes, where Mg2+ can compete with Na+ extracellularly for common binding sites in the erythrocyte Na+-Mg2+ exchanger [11, 14]. Although such a mechanism would only account for minimal Mg2+ exchange and its physiological relevance is questionable, we cannot exclude this possibility based on our data. It is interesting to note that the fivefold increase in Mg2+ uptake by SLC41A1 is high compared to previous experiments measuring CNNM2-dependent Mg2+ uptake (2–3-fold). In contrast to CNNM2-dependent Mg2+ uptake, the effects cannot be blocked by 2-APB, supporting that SLC41A1 mediates Mg2+ uptake and is not dependent on TRPM7. An exon-skipping SLC41A1 mutation has been previously associated with a nephronophthisis-like phenotype . This study by Hurd et al. described two patients with a homozygous SLC41A1 mutation that developed renal failure, eventually requiring renal transplantation . These patients did not manifest hypomagnesemia and/or hypermagnesuria, symptoms expected upon a tubular Mg2+ transport impairment. However, it must be indicated that kidney failure typically results in Mg2+ conservation , an effect that may mask renal Mg2+ reabsorption defects in these specific SLC41A1 patients. In contrast to the patient’s phenotype, no signs of renal cysts or dilatations were observed in our zebrafish model though our experiments were restricted to developing zebrafish (0–120 hpf). Furthermore, Mg2+ supplementation in the medium where zebrafish morphants were grown did not restore the Mg content to comparable levels as in controls. Similarly, in patients with inherited Mg2+ reabsorption disturbances and without renal cysts, Mg2+ homeostasis is not restored upon Mg2+ supplementation . A strength of our study is that the reduced Mg content was present when inducing the slc41a1 knockdown with both splice-site blocking and translation blocking MOs, a feature that was rescued by expression of mammalian SLC41A1. These results clearly demonstrate the specificity of the slc41a1 knockdown in zebrafish to yield Mg2+ deficiency and discard these results as off-target effects of the slc41a1 MO methodology used in the present study. A limitation is the use of HEK293 cells for our functional assays. However, Mg2+-transporting DCT cell lines are not available and our approach is more physiological than previous experiments. All measurements were performed in physiological Mg2+ concentrations (0.5–1 mM). Previous experiments were dependent on fluorescent probes and required super-physiological Mg2+ concentrations to load the cells (10 mM) [17, 20]. The use of stable isotopes is a more direct transport measurement than the use of fluorescent probes, which are sensitive to exchange with intracellular Mg2+ stores. An additional limitation of our study is that we cannot exclude differences in buffer capacity of the cells induced by overexpression of SLC41A1. In conclusion, our data indicate that SLC41A1 regulates the body Mg2+ balance by transporting Mg2+ in the kidney. Further characterization of SLC41A1 in renal cells is required to determine the molecular mechanism of SLC41A1-mediated Mg2+ transport. Based on the SLC41A1 function disclosed, patients with hereditary hypomagnesemia should be screened for SLC41A1 mutations. We thank Dr. Sjoerd Verkaart, Mariëlle Moors, Caro Overmars-Bos, Andreas Kompatscher, and Marc van Unnik for their excellent technical support during the performance of the functional analyses, and we acknowledge Dr. Gert Flik for providing the facilities for zebrafish experimentation (Department of Animal Ecology and Physiology, Radboud University). Dr. Jeroen de Baaij is supported by grants from the Netherlands Organization for Scientific Research (NWO Rubicon 825.14.021, Veni 016.186.012) and the Radboud Institute for Molecular Life Sciences. This work was supported by the grant from The Netherlands Organization for Scientific Research (NWO, VICI 016.130.668) to Dr. Joost G. J. Hoenderop, and by the Long-Term Fellowship from the European Renal Association - European Dialysis and Transplant Association (ERA LTF 175-2014) to Dr. Francisco J. Arjona. All animal experiments were performed in compliance with European (directive 2010/63/EU of the European Parliament), national, and institutional regulations and were approved by the ethical review committee of the Radboud University Nijmegen.